The album title and the cover artwork really don't look too bad. 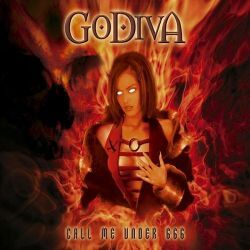 But the music is not too much my taste as Godiva from Switzerland play melodic hard rock music. On their second album Call Me Under 666, they managed however to get Fernando Garcia (ex-Victory) as a singer. After a boring intro, the first real song Hellraiser is sounding like a light version of Metal Church or Helstar. This is one of the few heavier songs on the album. The title track and My Fate are two melodic midtempo songs and the video edit When Lightning Strikes is strongly influenced by American AOR bands from the mid-Eighties. Although this kind of music doesn't excite me too much, Godiva show nevertheless that people from Switzerland can rock better than Krokus or Gotthard did in the last decades. I can only express my respect to Godiva for their very convincing and varied song writing. The Flight Of The Dragon is quite epic compared to the other tracks and Proud To Be A Beast draws strong parallels to the early Iron Maiden when Paul DiAnno was still their frontman. Especially towards the end, the album becomes harder and groovier, that's why it's a bit inappropriate to end it with a ballad (Free My Soul). This is no album that I will listen to several times, but I have to admit that it's one of the better recent hard rock records. It also lives from a strong production which Achim Köhler (Brainstorm, Primal Fear) was responsible for. As a bonus, you get the video clip for When Lightning Strikes on the CD.